I begin the process of writing most of my articles thinking that I’ll cover the subject in a single piece. Next thing I know, I’ve got so many notes that I realize that I’ll need to split the article into two installments. Then sometimes (as with this series) the subject takes on a life of its own, and I wind up married to a constantly-expanding article for over a year! Something that occurred to me since writing the last installment, is a key advantage gained by the formation of a winter cluster surrounded by a tight insulating shell of heat-generating bees. When a bee is cold, it shivers its wing muscles to generate heat. Just as you are not an efficient worker when you are shivering, neither is a cold, shivering bee. At the 50˚F (10˚C) body temperature of a worker in the shell, that bee is nearly paralyzed with cold, yet burning through honey to maintain even that temperature. As you can see from Fig. 1, as the ambient temperature around a bee approaches broodnest temperature, that bee’s sugar consumption rate drops to near nothing. Figure 1. 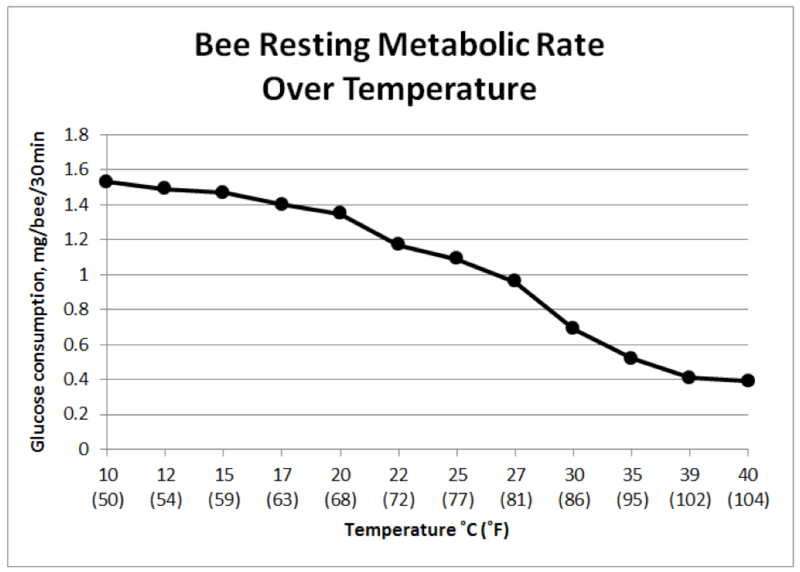 Note that the sugar consumption of a bee held at the temperature of the winter shell (10˚C) is three times as great as that of a bee held at broodnest temperature (34˚C). Such a shivering bee would have little energy left for the performance of other important tasks such as broodrearing. Data taken from . So what occurred to me is that by expanding the shell and creating a 34˚C environment in the center of the cluster, the colony would free the bees in the core of the metabolic demands of temperature regulation (other than the few “heater bees” that spot regulate temperature). In that balmy, protected environment, the bees in the core could instead employ their full energy for cell preparation, jelly production, and other tasks associated with broodrearing. Thus, this division of labor could be used to maintain a cohort of long-lived, heat-generating “winter bees” dedicated to maintaining the temperature of the shell, along with a shorter-lived portion of the workforce engaged in broodrearing at high efficiency. The rapid decline of the “winter bees’’” survivorship curve once they engage in broodrearing suggests that it is to the colony’s best interest for “winter bees” to remain in the shell, and only shift to the demands of broodrearing when necessary. Practical application: in the depth of early winter chill, there is no reason for the colony to raise its temperature much above the chill point. It is only when the cluster needs to shift its position, or initiate broodrearing, that it needs to create a 94˚F heated core. And once brood is started, that temperature must be constantly maintained in this bee-created tropical environment. Other than ensuring that the colony does not run out of honey stores, the beekeeper would do best to not disturb the delicate thermal arrangement of the cluster. 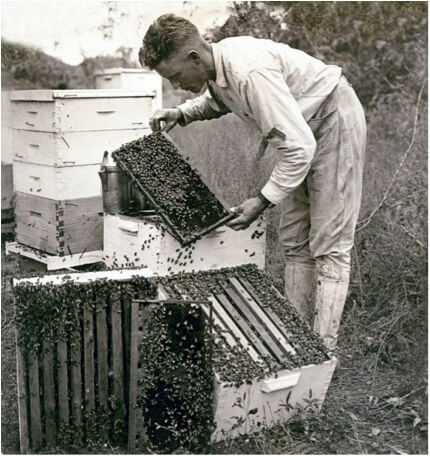 Perhaps the best treatise ever written on colony management for honey production is that by Clayton Leon Farrar in 1944 . In it, he has a meticulous cross-sectional drawing of a winter cluster (Fig. 2 (his Fig. 4)). Figure 2. I left Farrar’s caption, but you may not be able to read the fine print. The dark band is the insulating (and heat-producing) shell of bees. Note how the heated core occupies the area of empty comb, whereas the bees in the upper shell are in contact with honey. But what strikes me about the drawing is the thick layer of heater bees below the heated core. Of course, warm air and moisture rising from these bees would be of great benefit to the bees in the core. But the question then arises, how the heck do those bees obtain the honey necessary to supply their high metabolic rate? For that matter, how is honey normally distributed through the cluster throughout the winter? Those heater bees are sitting on empty drawn comb, not over honey. Does each of those bees individually need to move from time to time to fill its crop with honey, or do warm bees in the core transport honey to the bees in the lower part of the shell? Again, there is still plenty to learn about this remarkable creature! Practical application: the winter cluster is remarkably efficient at conserving honey. It is only when it expands to produce a heated core and ramps up broodrearing that it really starts to consume stores. Far more starvation occurs during a cold spring than during the winter. The European honey bee goes to great measures to ensure the most parsimonious use of its honey stores. Nevertheless, some amount of heat is always wasted (Fig. 1). Figure 3. For every gram of honey consumed, roughly 3 calories of energy are released—all of which eventually dissipate to the environment. The honey bee cluster makes great effort to minimize and direct that loss of heat. One can easily see in this photo (of some hives in my home yard) that heat is being lost through the center of the hive covers. Practical application: the above photo suggests an advantage to top insulation, which would move the heat loss from the top of the hive to the sides or bottom of the cluster, where it would be of greater benefit to the bees. Farrar studied the effects of insulating hives over the winter in Wisconsin . His conclusion was that moderately insulated hives performed the best, and that preventing drafts was of benefit. Beekeeper Mike Palmer in cold-winter Vermont showed me how he wraps his hives in a single layer of tarpaper to reduce drafts, but to allow the south side of the hive to heat up a bit when the sun shines, thus allowing bees to break cluster and take cleansing flights. Practical application: it may be more conducive for nosema management to encourage cleansing flights when the sun shines, than to over insulate a hive–thus preventing the sun from warming it. The cluster becomes filled with combs at its maximum summer volume, and subsequent contraction and the decline in bee population when breeding stops in the autumn leave large parts of the combs projecting in winter. The heat loss from these “cooling fins” is not diminished by cluster contraction, and the bees minimize it by keeping the cluster largely on empty combs, which have a much lower conductivity than combs filled with honey. Remember that in a winter cluster, the bees can only form a relatively solid mass if they are on empty drawn combs, with the empty cells filled by head-in bees. I long assumed (before I understood that the heating of the cluster was largely done by the bees in the outer shell) that the colony needed drawn comb to generate a “reactor core” of tightly packed bees. I realized that such is not the case when Canadian beekeepers told me that they feed singles with syrup until they weigh 45 kg (roughly 100 lbs). At that weight, there would be no empty cells in the hive whatsoever, so clearly, the cluster does not require drawn comb to maintain its temperature. That then of course means that with combs full on honey, that the cluster consists of a number of layers of bees approximately 3/8ths inch (10 cm) thick, separated by an inch of honey in the comb. Those layers of bees heat the honey between them, but how about the projecting honey at the periphery of the cluster—does it transmit much heat out of the cluster? Curious, I took a pair of digital thermometers and measured temperatures at the edge of the cluster on a cold day (Fig. 4). Figure 4. 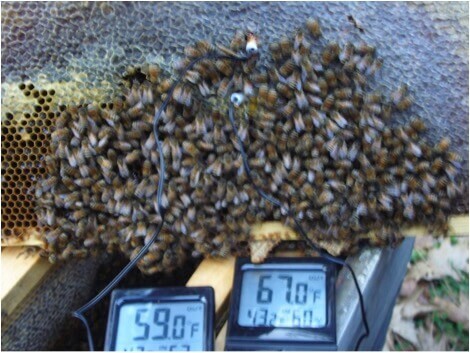 At 40˚F outside temperature, I placed two calibrated thermometers roughly 1 inch apart at the edge of the insulating shell of bees (now disturbed when taking the photo). Note the 8˚F difference in temperature between the probes. Down slightly lower in the cluster, the temperature was 94˚F. It appears that heat flows relatively slowly through honey combs. Figures are hard to find, but honey itself appears to resist heat flow on par with animal flesh, but not as well as animal fat . On the other hand, empty combs are far better insulators. Southwick measured the bees on one side of an empty comb at 33˚C, and the other side of the comb exposed to ambient temperature at only 8.3 ˚C (empty comb covered with bees had greater resistance to heat flow than comb without bees). Practical application: in warm-winter climes, or in shed wintering, where heat loss is not so critical, the cluster seems to do fine on solid combs of honey. But where winters are more severe, a core of empty drawn comb low in the hive may be of importance. Refer back to Farrar’s illustration (Fig. 2) to see how the cluster uses the empty comb space to its advantage. I’m guessing here, but it would appears that it would be of great benefit for heat conservation for any bees between combs of honey to maintain the lowest possible temperature (50˚F), and for the cluster to have an insulating layer of empty comb surrounding the much warmer core. It would be of interest to test a honey-packed winter cluster to see whether this is indeed the case. A warm core may also help the cluster to break during warm events and readjust to better reach its honey stores. Strong colonies with larger clusters appear to be able to heat up and move more so than can weaker colonies with small clusters. What I’ve found is that if the second brood chamber is wall-to-wall honey, that the cluster moves up into it more readily if at least one of the center frames has a patch of dark drawn comb. Many of the arguments given to back up any recommendations for providing more and more top-ventilation are based on reasoned considerations or anthropomorphic thinking rather than on sharp-eyed observations of bee behaviour. Or, I might add, the laws of physics. Toomemaa , by placing water-collection condensers at the top, sides, and bottom of hives, found that in an insulated hive, nearly all the water condensed at the sides and the bottom—not at the top. Practical application: as that water vapor condenses back to liquid, it releases its “heat of condensation”—either to the bees in the shell, or if that vapor escapes the shell, to the cold inner surfaces of the sides or floor of the hive. By my calcs, full recovery of this heat of condensation could reduce the heating requirement (and thus honey consumption) of the colony by about 12%. On the other hand, any heat lost through the hive cover would not benefit the colony. Unfortunately (or rather, fortunately), the winters in my area aren’t cold enough for me to truly test the benefit of top ventilation. But from speaking with a number of cold-climate beekeepers, it seems that good top insulation prevents the buildup of water or ice above the cluster (perhaps not if an excessive amount of honey is left above the cluster). Although the effects of the outside temperature on the cluster were reduced when the top entrance was closed, the bees were prevented from leaving the hive on warm days. Periodical bee flights in winter seem to make for a healthier colony. Without an upper entrance the bees were confined to the hive most of the winter and thus their chance for winter survival possibly was decreased. The lower body of the…hives never warmed up enough to permit the bees to fly from the bottom entrance. Practical application: top entrances may be of more value for bee egress than for ventilation, and should always be placed on the same side of the hive as the lower entrance in order to prevent cross drafting due to wind pressure. A smaller entrance may be better than a large one, in order to reduce convective heat loss. And how about reducing the main entrance for winter? We beekeepers might do well to keep in mind that it may be unwise to ignore the results of tens of thousands of years of evolutionary selective pressure on the honey bee. Bee races from cold winter areas tend to propolize their hive entrances nearly shut during winter, as do some of my Italian-type colonies (Fig. 5). Figure 5. About a tenth of my colonies build an eponymic curtain of propolis (from pro ‘before’ + polis ‘city’) across the entrance in late fall. This natural behavior suggests that bees prefer to restrict air drafts within the cavity during the winter. Practical application: entrance reducers not only keep mice out of hives, but may help the bees to better manage conditions within the hive. Beekeepers have kept bees in every imaginable sort of artificial cavity—each style of hive of course having passionate proponents (sometimes making extravagant claims). The fact is that bees are highly adaptable, and can thrive in nearly any sort of enclosed chamber during the warm season—they likely care much less about the hive design than does the beekeeper. The true test of a hive’s design occurs during the winter (which is why I am bringing up this subject in this article). Unfortunately, certain aspects of a hive that make it more amenable for practical beekeeping (such as minimizing the cost of materials and construction, having movable frames, or being transportable) may run contrary to what is best for the bees for a winter home. Bees evolved and adapted to build and arrange their combs in a vertical manner in the cavities of hollow trees, and thus are likely best adapted for similar manmade cavities (an inherent problem with any horizontal hive design). 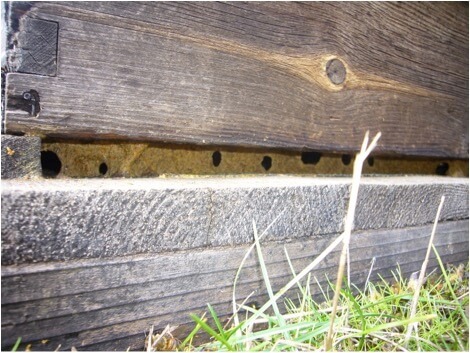 And although bees naturally build down from the top, a huge advantage to managed hives is the ability to allow bees to build upward—which, as pointed out by Farrar, allows for more rapid buildup, reduced swarming, and greater honey production (and from personal experience, much better drawing of foundation) (although Warre hives may be more “natural,” don’t expect the best production). Langstroth’s stackable, top-opening box hive with movable frames , has stood the test of time for well over 150 years (Fig. 6). It allows the beekeeper to offer his bees a far larger cavity than normally found in a hollow tree, thus allowing the colony to grow larger without swarming, and to store far more honey than it could in a more “natural” cavity . Figure 6. The Langstroth hive has clearly stood the test of time. While well-designed for productive beekeeping, it (and any other hive design) is of course not without its faults. The Langstroth hive is well suited for vertical buildup and frame manipulation. But its rectangular shape and thin wooden walls may not be optimal for either wintering or intense summer heat. I’ve run hives with either deep or medium-depth brood chambers, and get the feeling that bees do best on large, unbroken combs, and although I’ve yet to do so, I’d like to try one of the European hive designs in which a single deep brood chamber provides enough space for a vigorous queen . Practical application: although I’m loathe to offer beekeeping advice, in my own experience I’ve found that a “one and a half” (a hive consisting of a deep and a medium) provides enough space for broodrearing and overwintering in my climate. But it doesn’t allow for the swapping of frames between the boxes (I greatly prefer wooden frames, always squeezed tightly together). So I (as with most professional beekeepers in this country) use the standard “double deep” configuration, although this then has the drawback that the bees typically fill a band of honey across the top of the upper chamber, which then restricts them from working upward (it is not natural bee behavior to cross that band of honey, thus necessitating reversing the brood chambers for optimal production and minimization of swarming) . For those concerned about lifting heavy boxes, I’m not enamored with using mediums for brood chambers—they are expensive, there are half again as many frames to handle (and thus much more difficulty in finding the queen), and I get the impression that the bees don’t like the extra breaks in the combs. Perhaps a better option would be to use 8-frame equipment (2 deeps for the brood chamber, mediums above for honey supers). The narrower 8-frame boxes not only weigh less, but also keep the center of gravity closer to your body. The narrow width works well with the bees’ propensity to “chimney up,” but may result in very tall hives if you’re lucky enough to live in an area with huge honey flows. What I would suggest is to learn how to lift properly—an experienced beekeeper can lift heavy boxes up and down with very little use of his/her back muscles. To lift or lower a heavy box to the ground, keep your shoulders back, and always keep the box tight against your body (yes, you’ll get propolis stains across your belly). Tip the box tight against your chest, and slide it down until all the weight is on your belt or hip (when walking, keep your shoulders back and carry heavy bee boxes with the weight on your belt), then squat as you slide the box down your thigh, taking all the weight on a forearm resting on top of your knee. Then with your back straight, and both arms initially resting on your knees, bend your legs to lower the box to the ground between your feet. To lift a heavy box, reverse the process. Although the standard Langstroth hive lends itself well to productive beekeeping, bees may actually survive the winter better in other forms of artificial cavity. There are some interesting YouTubes of beekeepers using chain saws to create natural-style log hives (some quite artistically) . Mimicking nature is often a good idea. To that end, there are two recent studies of interest. 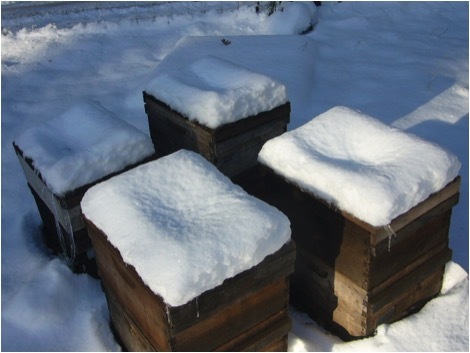 Toomemaa  compared overwintering in cylindrical (although short), thick-walled hives to single-story long-box hives (both types insulated). Although there were a lot of variables involved, the bees appeared to winter better in the cylindrical hives. Practical application: as best I can determine from a fairly thorough review of practical and scientific experimentation with wintering of honey bees, the optimal may be shed wintering at ~42˚F (exiting bees simply pile onto the floor of the shed). For outdoor wintering (roughly in order of importance), place the hive on a sunny slope, insulate the top of the hive heavily, tip for drainage, reduce the entrance, block the wind with tarpaper or a thin, black insulative wrap, and if the winter will be long and cold, provide a small upper entrance (with a wind block) on the sunny side of the hive. Thanks to Pete Borst for his unflagging assistance in research, and to all the cold-winter beekeepers who have shared their knowledge with me. Altmann G & H Gontarski (1963) Über den Wasserhaushalt der Winterbienen. Symp Genet Bioi ItaI 12:308-328. Farrar, CL (1944) Productive Management of Honeybee Colonies in the Northern States. USDA Circular No. 702. http://almus.net/docs/Pcheli/English/C.L.Farar-Managment.pdf A must read for any serious beekeeper. There are more details in his doctoral thesis: A Measure of Some Factors Affecting the Development of the Honeybee Colony (1931) Massachusetts State College. Simpson, J (1961) Nest climate regulation in honey bee colonies. Science, New Series 133(3461): 1327-1333. Southwick, EE (1985) Thermal conductivity of wax comb and its effect on heat balance in colonial honey bees (Apis mellifera L.). Experientia 41(11): 1486-1487. Möbus, B (1998) Rethinking our ideas about the winter cluster; Part II. ABJ August 1998: 587-591. Toomemaa, K, et al (2013) Determining the amount of water condensed above and below the winter cluster of honey bees in a North – European Climate. Journal of Apicultural Research 52(2): 81-87. 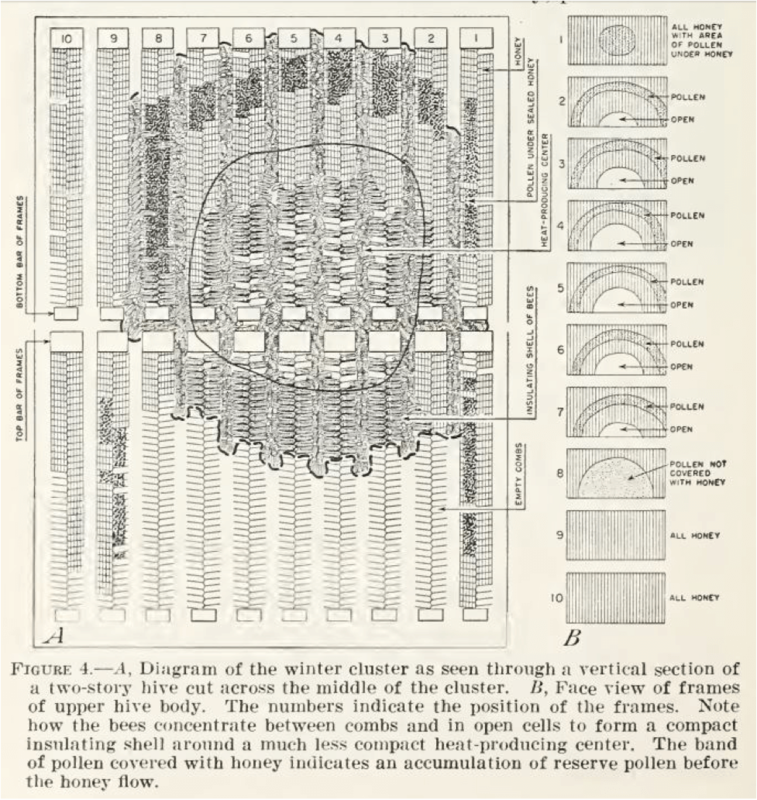 Owens, CE (1971) The thermology of wintering honey bee colonies. USDA Technical Bulletin 1429. Langstroth does not deserve all the credit; the contributions of European beekeepers Dzierżon and von Berlepsch should also be acknowledged. For a great history of hive design, see Kritsky, G (2010) The Quest for the Perfect Hive. Oxford University Press. The benefits of a larger colony in a larger cavity do not come without costs. Varroa builds to extreme levels in a larger colony, and the lack of natural swarming not only allows varroa to build up to a greater extent, but also reduces natural queen turnover. And during winter, an excessive amount of cold honey above the cluster may allow water vapor to condense on the combs and rain down upon the cluster. In the UK, examples of hives with deeper broodnests would be the Langstroth Jumbo, Modified Dadant, or Deep National. Australian beekeepers mostly use a single deep brood chamber with a queen excluder, and two deeps above for honey. They regularly rotate freshly-extracted boxes of comb (“stickies”) directly over the excluder (taking the filled third box away for extraction, thus “undercutting” the partially-filled box second box). The bees, not recognizing that there is an excluder stopping the queen, keep an arc of cells above the excluder cleaned out and prepared for her to lay in. This method requires regular attention in order to always maintain empty comb space in the second chamber, so that the bees don’t store honey in the brood box. Such fixed-comb hives would not be legal in states that require movable-frame hives that allow for inspection for disease. Toomemaa, K, et al (2016): Wintering of honey bee colonies in cylindrical nest cavities versus oblong box-hives in a North European climate. Journal of Apicultural Research 54(40: 285-291. Mitchell, D (2016) Ratios of colony mass to thermal conductance of tree and man-made nest enclosures of Apis mellifera: implications for survival, clustering, humidity regulation and Varroa destructor. Int J Biometeorol. 60(5): 629-638. Rectangular wood or plastic foam, square or octagonal Warre, hexagonal plastic foam, hollow tree, and dung-covered straw skep.